If you are currently looking for a job and still aren’t able to land one, then probably the field you are looking for isn’t hiring at this point. There are some companies that hire only during certain times of the year. Others will only hire when they feel like they’re running out of good and deserving people. And if you feel like a good job is nowhere near you, give this post a good read. In this article, you will learn about the job hunting process and best and worst times for job hunting. Here are some of the best times of the year you should try! The beginning of the year obviously means January and February. These two months are considered the best for job hunting and have also proved quite successful. Several companies at this time conduct interviews and activities. Some also organize seminars and if you want to land something great, January and February would be the right time for you. They are strong months overall and can provide you with great opportunities. The month of January starts a bit slowly as all hiring managers do not return from their holiday vacations until the second week of the month. But once something like that happens, there are hiring activities which can begin to pick up with a good pace and more interviews are conducted by that time. Plus a lot of interviews are delayed in the months of November and December because of which it is pushed in January and February. It definitely looks like a pattern right now. Just like the summer months are very slow, the early fall season tends to see an improvement in terms of hiring. More people are interested in looking for jobs because more hiring managers are ready to recruit. This is also the time when people come back from vacations. All of this also allows the interviews to take place with very little downtime. The process of hiring is nonetheless quite simple and smooth during this time. So if you want a job, try these two months. Though this period might not be as successful as early months of winter like it was enlisted in the article earlier, it can surely be seen as a runner up. Yes you might be living in an economy that is booming at this point but if your research isn’t good enough, then there is surely no point in hunting for a job. It is important that you know what you are in search of and what you may do for the company. Some experts have also stated that you should be prepared and know where the right jobs are. For starters, we would suggest you to have a LinkedIn profile. You must also anticipate some interview questions. This will help you know what the job description and how you can contribute to the company. You can only go for an interview if the companies are actually hiring. So make sure you stay updated with the current news and look up the internet and newspapers for regular advertisements. Not all companies are recruiting throughout the year. So it is important to stay alert and wait for the right time. The best time to job hunt is when you don’t need one but would like to have one. Experts say that at times like this the pressure is less and that you will not be in a rush to get a better one. You may use as much time as you please and land the job of your dreams. In that way, you will also have a better grip on your current job and easily be able to choose another one when the time comes. It could happen that you are preparing for a major presentation or project that is due next month. Experts have stated that at times like this the company needs you and it is vital that you stay until the assignment has been completed. If you leave in the middle, there could be a risk of burning some bridges. Therefore you should try to avoid this as much as possible. It so happens that people often end up feeling a psychological boost when an old year comes to an end. Experts say people are more enthusiastic during the beginning on a new year. This is also the time when they get ready to forget the past and embrace something new. Plus it may also be possible that a couple of your hiring managers become much more focused on filling some empty spots now that all vacations have come to an end. Some also say that a new year means a new job and a better outlook. In case you have a big vacation, we would definitely suggest you to keep the job hunting after it has come to an end. You really don’t want to be in a situation where you are offered a good job and later you are told that you have to start work right away without any delay. Experts also say that hiring managers are not going to want to train you for a couple of days or spend weeks and then stop until you have got back. However, if you have a great opportunity coming your way even if it is just before a vacation, go ahead and pursue it. You should keep all your personal plans on hold if that is needed. You don’t want to get a new job while you are pregnant or are going through some kind of divorce of breakup. These are big life changes. You don’t need a job change right now. If you have a job at the moment and think it can wait for a bit, then we suggest you wait till things have been sorted out and you are emotionally healed. Starting a new job will always mean that you will have to give in more time. Even the effort doubles up in the process. You also have to show to your new employer that you are capable and can handle the job. You must develop trust and faith that you will be able to deliver. When the months of November and December arrive, it is best to spend the time doing other things than looking for a new job. The middle of November means hiring less and saving the bulk for later. Since the year is coming to an end, managers are looking forward to scheduling some interviews and gathering people for more meetings the following year. During the months of November and December, they prefer to focus on the holiday season. The final two weeks of December are very popular since they are vacation weeks and people use the time on having fun and relaxing themselves. 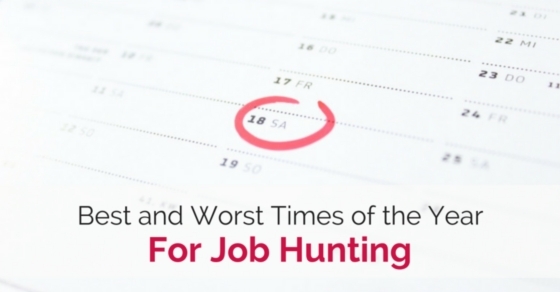 December is definitely the worst month for hiring as well as interviewing activities. The summer months are not the time to find a job. Managers are again looking forward to vacations at this time and it can get a little harder to bring the team together for an interview. Most of the companies look for people to fill in positions during the month of January and February. So in that way these three months seem appropriate. Plus summer months can get a lot more challenging for both the job seeker as well as the hiring managers since it is not easy to find the right team of people who make decisions. However make sure that you are able to stand out because of the fact that there are few applicants especially during summer months. Because of all of this, it is still better to do some job hunting during the months of summer. Even though these suggestions are good enough and can help you boost your job search, the best time to look for it is at any time. There are companies who like to hire for different reasons. Some of them are just trying to fill up the vacancies which are left by employees or those who want to change their jobs. So, in that case, you will always have the chance to get hired even though it is off season. Plus if you have liked this post and have some feedback to give, feel free to drop in a comment below. We would love to hear from you. Also a couple of questions are welcome. We will try to answer all of them. On that note, good luck! Previous articleWhat to do When Your Boss gets Fired or Resigns?